Among the English knights that stood before Branxton Hill and faced the Scots army on the 9th of September 1513 was Sir William Molyneux. He had made the long journey north from distant Lancashire with a “considerable force” to stand alongside his kinsman Sir Edward Stanley at the rear of the English ranks and in command of a company of archers. Stanley’s attack on the right flank of the Scots army would prove a decisive factor later in the battle. The two men were second cousins by common descent from Sir Thomas Stanley, 1st Baron Stanley of Knowsley in Lancashire. Sir William held the rank of knight banneret; that is one who could bring a company of followers into battle under his own banner. During the ensuing battle Sir William distinguished himself by capturing two Scottish standards, including that of Alexander Gordon, 3rd Earl of Huntly. Despite the loss of his standard, Huntly was one of the few Scottish nobles to survive the battle. He died at Perth in 1524. The captured standard subsequently hung at Sefton Hall. Research has revealed that also sharing command of the archers at Flodden was another Lancashire knight, Sir Henry Kighley (died 1526). He held the manor of Inskip, near Preston, and through the female line was an ancestor of the Cavendish dukes of Devonshire. Another neighbour of Sir William’s, Henry Blundell of Little Crosby is said to have been killed in the battle. As a result of his services at the battle, Sir William received a letter of thanks from Henry VIII, which survives in the Molyneux family archive. The family was later ennobled, and when Hugh Molyneux, 7th Earl of Sefton died in 1972 without issue, he bequeathed the entire archive (some 10,000 documents) to the Lancashire Record Office. The Molyneuxs were Lords of the Manor of Sefton in Lancashire, a parish between present-day Crosby and Maghull and now largely located in Merseyside, including much land swallowed up by urban expansion in modern times. Later the family added manors in other parts of Lancashire into their ownership, but Sefton Hall was the ancestral home until they moved to nearby Croxteth Hall completed in 1575. The family was granted a baronetcy in 1611, a viscountcy in 1628 and an earldom in 1771. The family came to Britain with William the Conqueror from their lands in northern France (where they were known as ‘de Molines’). They served under Edward ll in Scotland and Edward lll and the Black Prince in France, under Henry V in France and under Edward IV against the Scots. Sir William Molyneux’s date of birth is uncertain, being quoted as early as 1471, or as late as 1483 depending on the source. 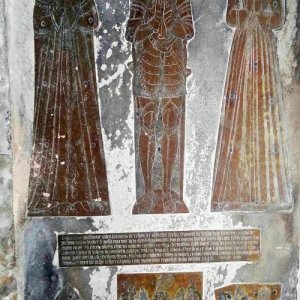 As his memorial in Sefton parish gives his age at death as 65 years, it is likely that 1483 is correct. He was born at Sefton, the son of Sir Thomas Molyneux and his wife Anne. He held the post of Sheriff of Lancaster (as did other family members before and after him). His father, Sir Thomas, had accompanied the army of Edward IV against the Scots and, together with his uncle, Henry Molyneux, was knighted by The Duke of Gloucester at the siege of Berwick in 1482. William’s grandfather, Sir Richard Molyneux, married Elizabeth, daughter of Thomas, 1st Baron Stanley, and fought on the Lancastrian side in the Wars of the Roses, being killed at Blore Heath in Shropshire in 1459. Sir William married first Jane Rugge, daughter of Sir Richard and Margaret Rugge of Rugge in Shropshire. She died at Sefton in 1521. Secondly he married Elizabeth Clifton, daughter of Cuthbert and Alice Clifton of Clifton-with-Salwick, Lancashire, and thereby inherited the Clifton manor. Elizabeth died in 1547, the year before William himself passed away on 16 March 1548. Old Sefton Hall lay opposite the parish church of St Helen’s and was demolished in the 18th century. It was a moated building, and the remains of the moat are still visible. The parish church of St Helen’s, Sefton contains the burial places of the Molyneuxs, including Sir William. Although this grade 1 listed building dates back to the 12th century, most of the present structure is from the 16th century. 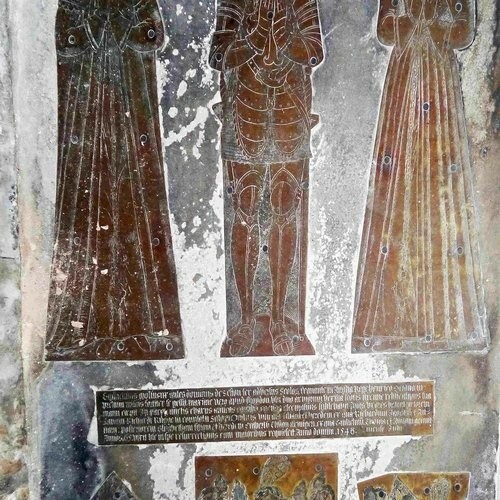 To the south side of the chancel is a brass memorial with the effigies of Sir William and his two wives set atop a marble slab. Sir William’s effigy is clad in armour and thought to represent his appearance at Flodden. The armour is not typical of the period, but dates from that commonly in use during earlier centuries, giving rise to the belief that the muster to war carried so little warning that knights and men were forced to use armour left over from their ancestors. The ownership of this second banner has not been established, and the part of the brass representing it has been broken off. The memorial was originally in the chancel, but was removed to its present location for better preservation. And so this document has led us back to an actual memorial referring to the Battle of Flodden preserved in a Lancashire church far from the scene of conflict. Moreover, without a chance conversation with a retired Lancashire archivist, Gordon Read, the existence of the document might have been forgotten and important information about persons present at the battle would never have come to light.